Beyond the safe, natural and effective oral preparations for pain and inflammation, there is an increasing need for practitioners—and their patients—for a pain-reducing and healing topical aid. But finding the right fit to take care of all the sprains, strains, and abrasions that come your way can be a challenge. After all, you want something that works, is safe, has been put to the test, and can be used by children because you know the kind of skins and scrapes they can get. Fortunately, there is a botanical answer that is clinically tested and real-world ready, but its primary ingredient—comfrey—may come as a surprise. To anyone familiar with herbal medicines, comfrey has had an “on- again, off-again” reputation as a healing plant. That’s because, as traditionally valuable as comfrey was considered to be, it was also discovered that the roots contain compounds called pyrrolizidine alkaloids (PAs) that can be toxic to the liver. So for internal use, comfrey was off-limits. And doubts lingered about its safety as a topical, too, because it is readily absorbed through the skin. 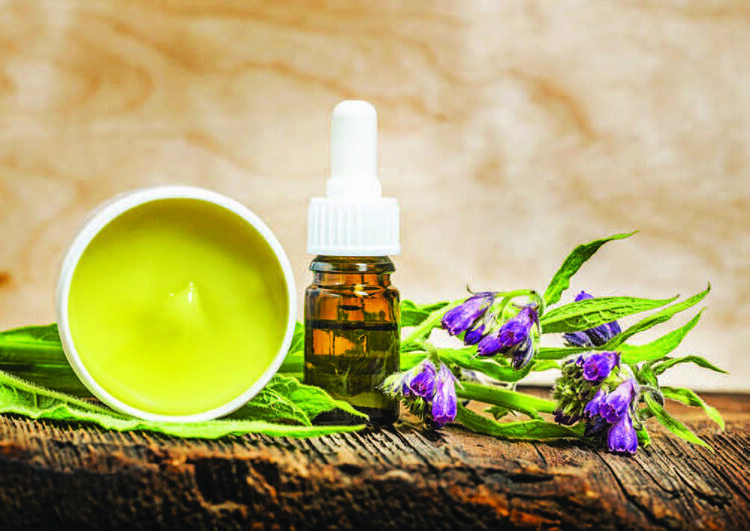 Thanks to a specialized comfrey that has PA-free flowers, stems, and leaves, the resulting topical cream made from it is completely safe for use. In Germany, this variety of comfrey is known as Symphytum x uplandicum Nyman, and has been designated as “Trauma comfrey” by the German health authorities. In another study, 361 boys and girls between the ages of 4 and 12 who presented at eight German clinics were treated with Trauma comfrey for sprains, strains, and bruises that had occurred in the previous 48 hours. Significant improvement was noted in three days for sprains and in four days for strains and bruises. Again, no adverse effects were reported. If you’ve considered topical comfrey in the past, but wondered if it could be part of your current treatment protocols, the answer is a resounding “yes!” Clinically-tested, specialized Trauma comfrey brings this ancient botanical into the 21st century with research and a stellar safety profile to back it up. Holly Lucille, ND, RN is the author of The Healing Power of Trauma Comfrey, and Creating and Maintaining Balance: A Women’s Guide to Safe, Natural, Hormone Health. She serves on the American Association of Naturopathic Physicians board of directors and is an acclaimed expert in the field of integrative medicine, she lectures across the country on natural health topics. She can be contacted through drhollylucille.com. 1 Barna M, Kucera A, Hladicova M, et al. Wound healing effects of a Symphytum herb extract cream (Symphytum x uplandicum NYMAN): Results of a randomized, controlled double-blind study. Wien Med Wochenschr. 2007;157:569-574. 2 Niedner R, Effect of an Active Substance Complex from Symphytum on Epithelialization. Acta Therapeutica. 1989;15:289-297. 3 Kucera M, Kalal J, Polesna Z. Effects of Symphytum ointment on muscular symptoms and functional locomotor disturbances. Adv Ther. 2000;17:204-210. 4 Kucera M, Barna M, et al. Topical Symphytum Herb Concentrate Cream against Myalgia. Adv Ther.2005;22:681-692. 5 Hess H. Effect of a Symphytum Ointment with Sports Injuries of the Knee Joint. German J Sports Med. 1991;42:156-162. 6 Mayer G. The Local Treatment of Acute Lateral Distortions of the Ankle Joint with an Ointment Containing Symphytum Active Substance Complex. Acta Therapeutica. 1991;17:89-100. 7 Mayer G. The Local Treatment of Contusions and Distortions of the Knee Joint with a Symphytum Active Substance Complex Ointment. Erfahrungsheilkunde. 1992;12:888-891. 8 Kucera M, Barna M, Horacek O, et al. Efficacy and safety of topically applied Symphytum herb extract cream in the treatment of ankle distortion: results of a randomized controlled clinical double blind study. Wien MedWochenschr. 2004;154:498-507. 9 Barna M, Kucera A, et al, Randomized Double-Blind Study: Wound- Healing Effects of a Symphytum Herb Extract Cream in Children. rzneimittelforschung (Drug Research). 2012;62:285-289. 10 D’Anchise R, Bulitta M, Giannetti B. Comfrey extract ointment in comparison to diclofenac gel in the treatment of acute unilateral ankle sprains (distortions). Arzneimittelforschung (Drug Research). 2007;57(11):712-6. doi:10.1055/s-0031-1296672.